Ummm. . . In my house we use rather a lot of five spice, getting through those tiny 65 gram Schwartz bottles in a couple of weeks. So I decided to make my own (photographs in the April photoblog) and collected the necessary ingredients from the Halhal Meat Centre. With 100g of the five main spices, costing about £5 total, I guessed quantities and gently dry roasted the mix in our massive karahi. This wasn't a great move as it made things slightly sticky, but made a good smell. Transferring to my pestle and mortar, I broke the star anise down ready for the blender. I used a standard blade blender which just bout did the job, but left the mix with a variety of size grades. This was then sieved to filter off the finer grind with the chunky stuff left for marinading purposes. 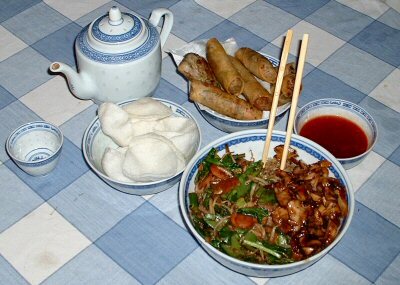 I really like to cook Chinese food, and have been doing so since I went to university. The following list forms part of my repertoire. I've since been to China and have learnt more dishes that aren't included here such as 'fish flavoured aubergine' and 'egg and tomatoes'.